For what Austin had in art, Nashville equally impresses with music. I love it here. There is live music nearly everywhere you go. Granted, most of them are cover bands, but live music definitely makes me happy. First, you have Broadway. It is the tourist section with famous live music venues such as Tootsies and Legends. 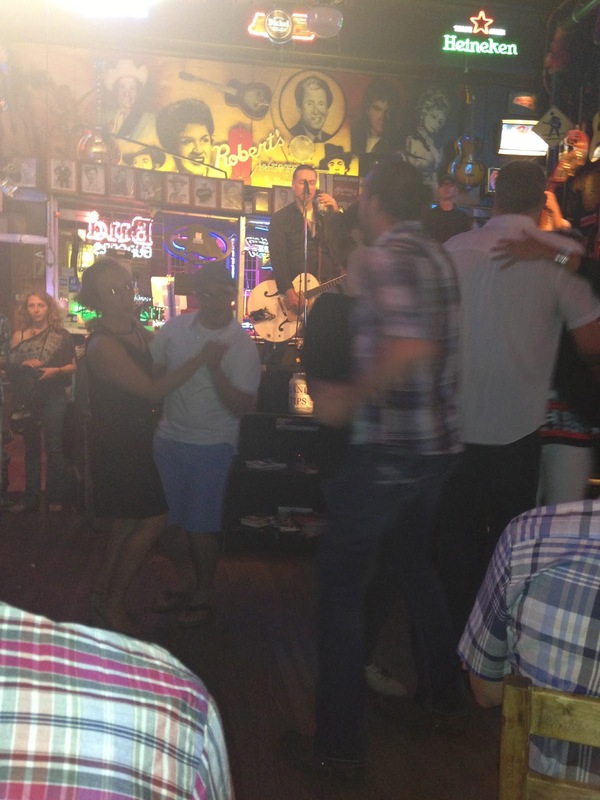 You can listen to old country at Roberts and have 3 floors of fun over at Honky Tonk Bar. What you'll find here is what you expect, cover bands, drunk tourists, street performers and locals looking for their Tinder matches. Everyone needs a Broadway night or two and honestly, its a sure bet for music anywhere you go. Andy and I started off at The Stage where Cort Carpenter and his band were peeling off every top 20 country hit they knew - and some that they didn't know. One thing I have found all too common in Nashville is that these cover bands don't know the lyrics to all the songs and use iPads and iPhones to help them out. I think its great that they want to take requests, but there is no shame in saying you don't know that one. Go home and learn it and play it next time. Being a musician is a craft, you should respect it and learn the lyrics or at least fake them. Cort was good fun, he's a good show. The next bar we ventured into was Tootsies. You can't go wrong with Tootsies, its a classic. While at tootsies, the Hillbilly Allstars took the stage. Their lead singer looked a bit like a cowboy viking, but he had a good voice and a good sense of humor. Their catalog was a little broader than most of the other bands I'd heard in Nashville. They branched out with Alabama, Old Crow Medicine Show and of course, the top 20 as well. They were taking requests for immediate play for $20 and playing original songs for $100 a pop. It was very tempting to walk $20 up there to hear them belt out their best Dixie Chick rendition. But, I refrained since I was so entertained by our new friends, Chiara and Danny, "the Italians". Prior to meeting them, I photo bombed a photo by issuing Chiara bunny ears and posing wildly in the background. Upon reviewing the photo, she laughed and turned to take a picture of my brother and I. Andy engaged in conversation and soon learned their English was limited, but they were surprisingly great communicators. 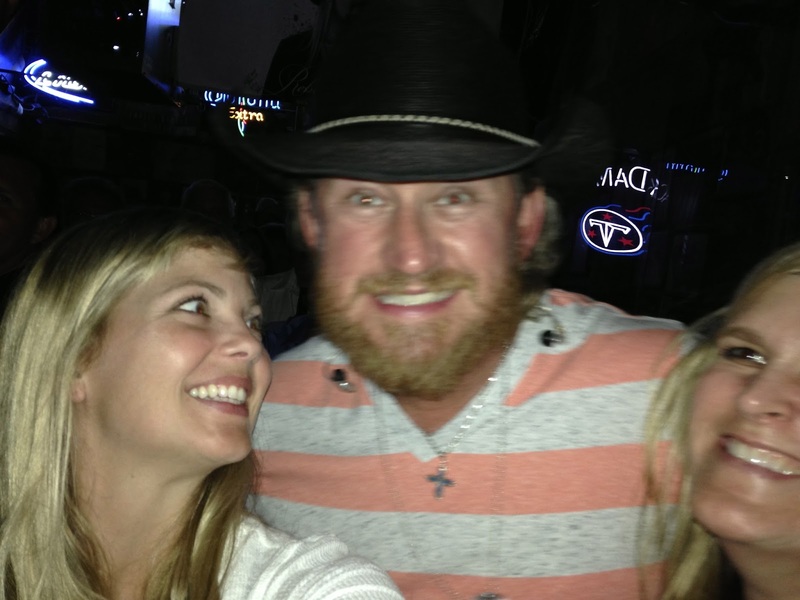 Andy introduced them to Fireball whiskey and we traded rounds for about an hour. 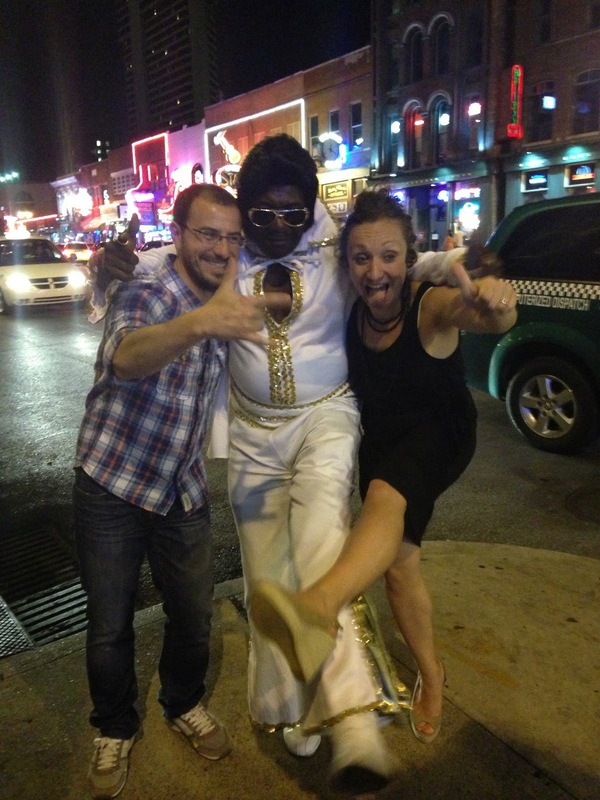 Andy gave them recommendations of things to do on their last day, however based on how the evening ended it would be a long shot that they actually made it to the Parthenon of Nashville. The next bar we went to was my brother's favorite, Roberts. Roberts has the best grilled cheese I have ever tasted. He loves this bar because they play old country from the 1940's and 1950's. We got a couple grilled cheeses and a round of beers (cider for me, of course) and the Italians watched in awe as older couples twirled around the dance floor to this ancient country sound. Andy took the cue and asked Chiara to dance, which she happily accepted. The two of them put their 3 left feet to work and showed Nashville that a good time did not require technical dance training. Meanwhile from the table, Danny watched like a hawk. Like most Italian men, he was clearly very protective of his beautiful wife. Andy is an old soul and was really just looking to show them a good time, so his initial protectiveness was snuffed quickly. Another round of Fireball shots capped off this bar and we were off to Honky Tonk Bar. Andy is such a good tour guide that he insisted we all get photos with the Broadway lights behind us. 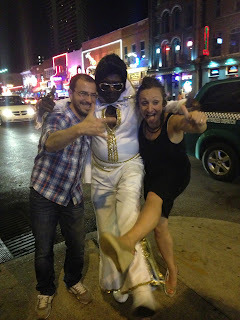 And of course, a photo with black Elvis. We did have to draw the line at the hula hooping Cat Lady. One more round of Fireball shots to initiate this bar and we walked upstairs. Chiara had moved beyond tipsy to wasted. We decided to hang out on the balcony to people watch. Again, we had another top 20 country cover band supplying background music while we judged passersby and danced on the balcony. A good night is marked with one person in the group booting and rallying. Well, that happened. I'll leave out who the offender was, but we all sealed the evening with well wishes, Facebook friend requests, and a promise to look them up while in Florence for an evening of good food and good wine. Done. Looks like I have a date in Florence, Italy! 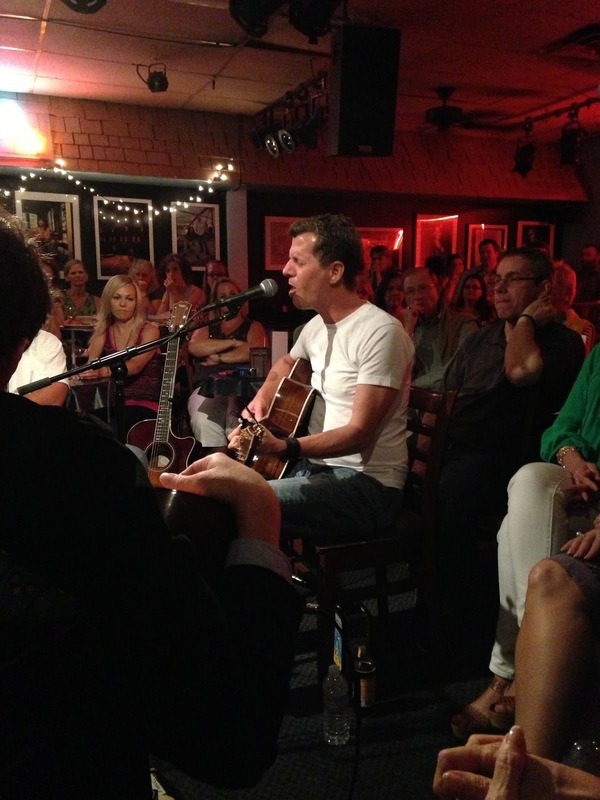 The best bar in Nashville is Bluebird! The Bluebird is Nashville's answer to Austin's Graffiti Park. This venue, although featured weekly on the TV show, Nashville, has created an homage to songwriters with this small 20 table venue. You can purchase tickets in advance for their 9PM show, but if you feel like rolling the dice, they let 10-12 stragglers in nightly. I decided to take my chances. Worst case scenario, if I got turned down, I could buy tickets for the following evening, right? Well, 2 girls jumped in line just before me with their friend and as luck would have it, that filled up the venue. I decided to stick around and listen to the music from outside and the doormen found 2 seats for the other straggler, Moira, and I...right in front. They were the best seats possible. We were within breathing distance of the 4 musicians sitting in a circle with their acoustic guitars. Performing that night were, Fred Wilhelm, Kevin Fisher, Tim James and Jay Knowles. Individually, I'm sure you have never heard of any of them, however, each of them were highly acclaimed songwriters that were the ghosts genius' behind George Strait, Allan Jackson, Rascal Flatts, Sara Evans, Walker Hayes and many, many more. The best part of this show was that these guys were truly friends. They teased each other about weddings, divorces, successes, failure and anonymity. Net net, I hit the jackpot. Thank you boys for a super rad, unexpected evening.